Thread: "help with macro please"
Just a Thought, " ARE EXIT SIGNS ON THE WAY OUT "??? Re: "help with macro please"
I'm just going to jump right into this topic, and try to do so more or less following the general 'order of importance' for issues to be addressed when starting into macro photography. 2) With macro photography, the depth of field (area actually in focus, from the front of the image to the back) is very, very narrow. The only way to increase the depth of the image that is in focus is to use a smaller aperture (larger f/ number); but that requires a slower shutter speed, or, more light. So now we begin to find ourselves dealing with "macro accessories." 3) A tripod always helps; and with it, add in a cable release of some kind. More light helps; and particularly helpful is a 'ring flash,' which fits around the end of the lens (rather than on top of the camera). Most helpful of all (after all the other things are considered) is a focusing rail, which allows you to move the camera back and forth, and, from side to side by turning a little knob(s). Those are not cheap but of you do a lot of macro photography they are invaluable - something to keep in mind for a little farther down the road when you decide of macro work is something you would like to do a lot. If you have the subject free in front of your tripod it can sometimes be easier to just move that rather than the camera and tripod. If the subject isn't something that can be freely moved, sometimes it is easiest to set it so that the two front tripod legs are on either side of it; and then the distance can be slowly shifted by gently sliding the back tripod leg up or down (one hand above, the other below the spot where the sections of tripod leg join then gently push the top hand away with the bottom thumb - for up) but of course you'll have to re-frame the photo and maybe adjust the focus a bit as well. Some people use extension tubes on macro lenses for greater magnification; or, teleconverters for more distance from the subject being photographed. A lot depends on what it is that you want to take macro shots of: with flowers, for instance, a tripod is well matched to a 'plant clamp' ("plamp") which will hold the flower steady by clamping onto the plant's stalk. Hi Terry, and welcome to CiC. I will not repeat the excellent advice/tips that John has given already but will mention that as you are new here you may not be aware of the tutorials section. Within them there's one on 'Macro' and also many available online as well and once you have read just a few you will see there's no real magic required only patience on your part and repeated practice. There's also been a few threads here on macro recently with some good subject content and advice. I'm not familar with your camera but if it has a 'Mirror Up' function this is also a bonus when tripod mounted to reduce movement. There are some very good 'cheap' remotes and focus rails on ebay which I have found to very good value for money in the past, but your priority must be a tripod first. Anyway, good luck with your new venture and don't hesitate to ask any questions here, you will always get excellent fast help. Just as an add-on to Grahame's comment re the previous threads that have discussed macro - If you click on 'Discussion Categories' on the menu bar above and then choose 'Macro Photography', you'll see a whole lot of threads on the subject. Some will, I'm sure, be more useful than others, but there is a lot of valuable information in there. By the way - Welcome to CiC. Thank you for joining. So that you don't continue to get people asking you what your proper name is, because most us use that on here, you can go to Edit Profile and enter your proper name under 'Real Name'. Then it will appear underneath your Username in all your posts. You can also enter your location so that it does the same, just as in my details alongside this message. Then we all know where everyone is in the world. There are a few of us here from the Plymouth area, Terry. I'm 20 miles away but Mark is closer; when he isn't sailing the seas. During the Summer I do a lot of live insect macro work, but with a Canon camera and bigger lenses. For normal macro shooting I set the camera manually, typically 1/200 F14, then use flash to suit the scene; and vary the flash output compensation as required. However, when flash isn't suitable I shoot on Av because getting sufficient focus depth is usually the most important item. This often needs an increased Iso setting although static subjects can be photographed with a longer shutter speed providing you have a stable tripod. Another option which I sometimes use for static subjects is to add some extra ambient lighting. 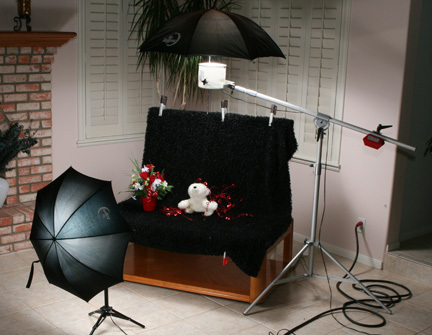 Such as various studio type lights; but watch for any white balance problems if you aren't using daylight quality lamps. Hi Terry and welcome, I am also new to macro and have learnt so much from asking questions on CiC. The best way to get advice is to post a few pictures and that will show the macro specialists where you can improve. One thing I have come to grips with is that you often have to compromise by using a higher ISO in order to achieve the aperture and shutter speed you need when shooting macro. Particularly when the subject isn't completely still such as a flower in the breeze or an insect that is moving. In this case the tripod isnt always helpful and can be a hindrance. Good luck and enjoy. I am not sure if this has been covered in the macro tutorials but, a focusing rail is a very handy accessory when shooting macros while mounted on a tripod. The focusing rail will allow minute movements of the camera/lens without needing to move the entire tripod. It allows more precise framing and focusing. I use an old Minolta focusing rail which is well built and all that I need. However my rail allows only fore and aft movement. There are some focusing rails which allow left to right movement in addition to foe and aft. I light my macros with a standard Canon hotshoe flash mounted on a Seigelite flash bracket and modified with a Lumiquest Softbox II. You have some excellent suggestions already, so I will only add a few. i think focusing will be a lot easier when i can get some good light on the subject that is permently on when focusing. Lighting is one of the most important aspects of macro photography. Bright light is needed not just to help focus, but to get a reasonable depth of field. Unless you are in bright sunlight or have a static subject that will allow a long shutter speed, that means either cranking up ISO a great deal, which would degrade the image, or using artificial light. The most common approach to lighting for field work is to use a highly diffused flash. Richard showed one way to do it. Mine is more similar to this one. If you google, you will find quite a few posts on this. Most are do-it-yourself rigs. I do most of my flower macros indoors, to get more control, and for that, I use halogen lighting and long exposures. The advantage over flash is that I can play with different lighting before starting to take pictures. I bought two inexpensive boom lights, put 50 or 75 W halogen floods in them, and tape diffusers over the front. Sometimes, I use a cheap umbrella reflector on one of them to get some indirect lighting. You can buy a pack of Manfrotto diffuser sheets inexpensively, but lately, I have been using the parchment paper sold for baking. You will need to adjust white balance if you do this. I've posted a photo of my indoor rig on another recent post here, but I can't find it, so I will post it below. The flower is held by a "plamp", an inexpensive plastic gooseneck clamp. Often I just pile stuff up and put a vase on top, which is what you will see in the photo. Hope this helps. Glad to see another macro photographer on the site. Last edited by rpcrowe; 23rd November 2012 at 06:24 PM. Thank You Richard @ Dan and other contributers for your helpful information as regards my taking on the Macro challenge hi. Like the look of Dans set up as i already have a few bits and pieces similar that can be modified. I think a flash is the next item on my list and a slide rail Thanking you all for your kindness and patience, Take Care Terry [tickover] Plymouth U.K.
All times are GMT. Page last updated at 04:36 PM.